Amy Agnew is a Senior Attorney in the Dallas office of Cooper & Scully, P.C. She focuses her practice on litigation with an emphasis on personal injury, premises liability, professional liability and trucking cases. Amy represents locally owned businesses as well as national corporations. She provides representation for clients from pre-suit investigations through trial. Amy has extensive experience in motion practice, taking and defending depositions, written discovery, and witness preparation. Amy has successfully achieved summary judgments in both state and federal court on behalf of premises owners. Amy has practiced in state, federal, and administrative venues. Her practice also includes complex civil litigation matters, such as commercial disputes, construction law, products liability, and general insurance defense issues. 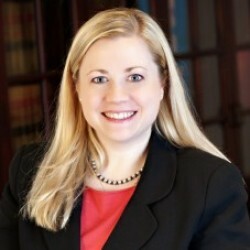 Prior to joining Cooper & Scully, P.C., Amy was an Assistant Disciplinary Counsel with the Office of the Chief Disciplinary Counsel for the State Bar of Texas where she represented the Commission for Lawyer Discipline in disciplinary proceedings including first chair experience in front of grievance panels. Amy was born and raised in Dallas, Texas. She received her B.A. in Political Science and Spanish from the University of Richmond in Richmond, Virginia. One of her favorite college semesters was when she studied abroad in Seville, Spain. After college, Amy worked in Washington, D.C., for U.S. Senator Phil Gramm. Amy then returned to Texas to attend the University of Texas School of Law. Amy is a member of Highland Park United Methodist Church and also the Junior League of Dallas. Through her involvement with the Junior League of Dallas, Amy was a project chair for VMLC, an organization focused on adult literacy, as well as both a researcher and facilitator for the Research & Development Committee for the League. Amy enjoys traveling, live music, reading a good book, college football, and spending time with her family and friends. Granados v. Walmart Stores, Inc., No. 15-10837, ___ F. 3d ___ (5th Cir. 2016) – Upheld trial court’s dismissal of premises liability claims against a retail chain store for lack of evidence to create a fact issue on the time-notice rule that the premises owner had actual or constructive notice of an unreasonably dangerous condition. Renee Smith v. Braum’s, Inc. - A premises liability case tried in the Eastern District of Texas, Sherman Division before a jury. This lawsuit was a premises liability action wherein the Plaintiff alleges she tripped and fell on pavement outside of one of Braum’s, Inc.’s stores. Plaintiff sought damages for her injuries. Unanimous defense verdict obtained on behalf of client, Braum’s, Inc.
Pecina v. Monterey Foods, LLC - defense case tried in Dallas County, Texas. The lawsuit was a premises liability action wherein the Plaintiff tripped and fell in one of Monterey Foods, LLC's grocery stores. Plaintiff sought damages for her injuries including, pain and suffering, past and present physical impairment, and medical expenses. Defense verdict obtained on behalf of client, Monterey Foods, LLC. Moreno v. Southeastern Freight Lines and Josh Tatum – defense case tried in Dallas County, Texas. The lawsuit was a trucking accident wherein Plaintiff alleged Southeastern and its truck driver were negligent. Plaintiff alleged that Southeastern’s driver, Josh Tatum, made an improper lane change and struck his vehicle, totaling his vehicle. Plaintiff sought damages for his injuries including, pain and suffering in the past and future, and medical expenses in the past and future. In Plaintiff’s initial pleading, Plaintiff sought damages in excess of one million dollars. Unanimous defense verdict obtained on behalf of clients.